Well I guess I’ll be the guy to kick things off. Since 2015 I have watched a group of 4 bucks grow mostly through trail cam photos. Being a guide and having little to no time to hunt I was never able to seal the deal. From the past years opening week and mid October were the best time of year to hunt these 4. Opening day here in Manitoba was Monday August 27 I set up for an evening hunt on a funnel between bedding and feeding area. However this year I had not had any cams out and was going in blind banking on the fact that the bucks made it through last season. I hung my lone wolf and 10 minutes later a group of 8 bucks and a doe came past at 80 yards. 3 of the bucks were the dudes I had history with. Super pumped to see them but wondering where the fourth was, it wasn’t long until I heard a deer approaching my setup out stepped a 120 class at 37 yards and following him was buck number 4. I drew stopped him at 33 yards and drilled him for a 50 yard recovery. He was down in sight and in seconds! Good luck to everyone this season! May your arrows fly true! I'm headed to KY in two days to start my season Sept. 1st. Way to kick it off...Nice shot! Congrats on a beautiful velvet buck! Love that this thread has started! Awesome velvet buck Tyler! Congrats! Great buck and looks like a perfect shot! I still have a month to go here in PA. CAN'T WAIT! Opener in a few states today, where they at?!? Thanks fellas! Hope you can all add to this post over the next 3 months! Good lick out there. Got my tags punched in KY! Super special to have my dad and two brothers along - we piled them up in KY! Hunted along a sunflower field tonight, a spot I had never sat at before. This sleek buck strolled by and gave me a 22 yard shot. 50 yards later he went down. It’s starting to roll now! Congrats fellas! Great kick off fellas.... Congrats to all. Cheers to 2018! My son Dylan with a Arizona coues ! My first trad bow kill.... Got it all on film! Pretty fun to have a "first time" at this stage in my hunting! Loving the trad kills! And some beautiful early season bucks too! My son Zach with a big bodied Nebraska buck! Sep 13th NC mountain doe. Minnesota bonus does; late September and early November. I figured I'd bump this thread back to the top. I ran up to NJ to hunt with Bowsiter njbuck for a long weekend last week. I managed to do some damage to the doe population and shoot a nice urban buck in the process. It sure was a different kind of hunting than I'm used to, but I had a blast doing it. Great pics so far. That NE buck is huge! Opening day doe in Chautauqua county N.Y.
Chautauqua county N.Y.eight pointer killed Oct 3. Shot a doe Saturday evening September 29 from my ground blind. My three kids helped me set it up on the edge of a corn field two days before and my 4 year old son was with me for the first sit. This was my first deer from a ground blind. Frontal shot at 15 yards. 65 yard recovery. My son on his first trip to the blind with me. Excited to be sitting with me the whole time. Now that's success! Nice Dehaverstick! Thanks for sharing the video. Yoda, now that is what hunting is about. Good luck!! My 15 year old daughter Teja killed this buck the first morning of the PA archery season 09/29/18. Love the smiles in Yodameister's pic & Blessed Bowhunter's pic!!! Congrats to Teja on a beautiful buck!!! Operation "Full Freezer" is advancing nicely! I filled my tag in a first hour , first day hunt of season. Passed 6 does and a 10 points buck. 30 deers around on my eyes sight. I didn’t want to passed this buck because I have limits time to hunt this year. Shot him at 41 yards, he ran less than 50 yards. Last Saturday morning at 8 am, this dandy PA 8 pt, was walking out of my life, until I grunted him back in. At 30 yards, I let loose my Rage Trypan tipped Beman ICS Classic, found it's mark, and the rest is history! Got to break in my new to me PSE BowMadness 34. Congratulations to all who were successful so far, and good luck to the rest of you!! My eastern plains Colorado white tail from this weekend. My first white tail as well! Managed to score on this buck during a cold snap here in Nebraska! Great deer, guys and gals! This thread almost dropped off the front page, so I'll bring it back up. No antlers for me yet. One good plump iowa doe so far. Sorry, I can’t seem to edit my last post so I’ll add a photo here. My 10 year old son got his first bow kill here in WV. 3pt buck. Used his Mission Craze II, Easton Bloodline 480s and 100gr Magnus Stingers. Urbncwby, Congrats to your son!!!. One of the many memories you will make with him. This thread is getting ready to blow up. 2nd Ohio doe this year. Way to go, young Urbncwby!! Love that smile! Congrats to others as well. Must have been steep on that mountain . Congrats Justin !! IL 10/24. Bring on November! There's some awesome bucks being killed. Congrats to all. Oh Dave that buck gets my juices flowing! Always exciting to see the first of those mature pre-rut bucks starting to drop! Nebraska doe, back out in a week for some buck action. Arrowed this buck during a cold front in NE. 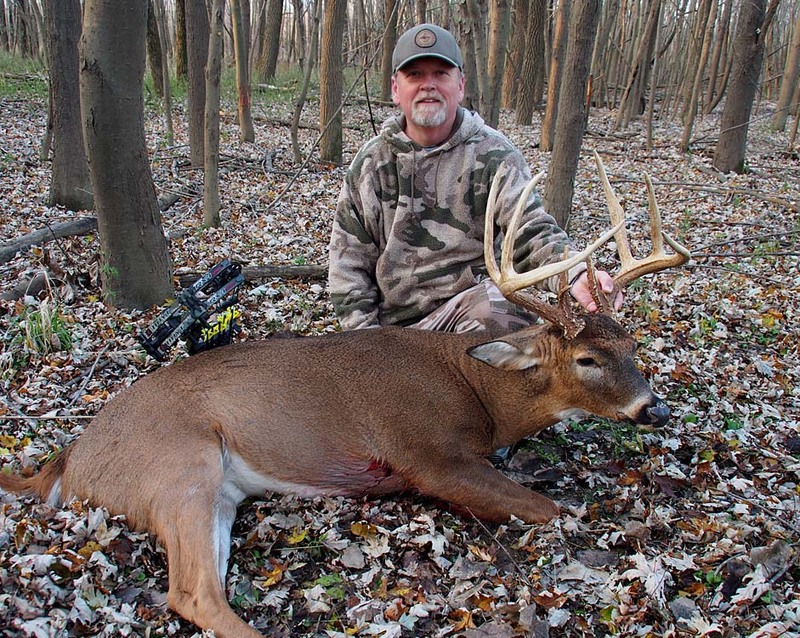 Awesome buck, Martin, but the real trophy in that photo is your mustache! Long Island New York. October cold front had them up and moving during daylight. Sven yard shot. Arrow passed through his opposite leg. Great day, saw lots of deer ncluding a bigger buck tearing up scrapes. Got an 8 pt on 10/23. My Ohio 10 point. 10/25/2018. Very blessed to have shot and recovered this buck. Thanks Will. Used an elk hunter trick. Frontal shot. First ever. I won't hesitate to use it again in the right situation. He went maybe 40 yards and I have never seen a blood trail like that before. They are absolutely lethal. Never would have had the confidence to try it without all the time spent looking at the elk threads. Altitude sick, great looking buck but come on man you can't leave us hanging with no story. October 26, 2018. First deer with recurve. Six days later. November 1, 2018. First buck with recurve. Very thankful for both! My wife shot it on her first sit behind the house. 25ish yards. Hit the top of the heart with a slick trick. It went about 50 yds. It was just cruising through. I have this deer on camera throughout the summer and fall. He’s around 140” gross maybe mid 40s. She on a roll. A mid 130s 144, 150 ish and a 184” last few years. And the left beam is over 5” at the base, so no $500 fine. My daughter arrow this one! I got him on my trail camera one day in August, Never saw him again until she shot him. Shot this ND Whitetail last night at 19 yards. I actually snort-wheezed him away from chasing a doe! November 1st in pouring rain. Watched him just about every evening in July and a few evenings in August feeding in a soybean field behind my house. Buck #2 here in Nebraska November 3rd! Thanks to HUNT MAN for the big help on the blood trail! Many great deer falling to the arrows! Congratulations to all the successful hunters! The rest of you better get after it! Good luck! Arrowed this buck during the MN gun season. Orange is the requirement. Noguts, what an absolute hog; big old deer. Consider sending in a tooth on that deer. Grats! 10-24-2018 MN ten-point. 15 yard shot. 18-Oct-2018 My son Matt's first archery buck. November 4th. Followed a doe past my stand at 12:15. 11/6 Iowa public land. Spot and stalk. Here are a couple does I shot. I usually dont take doe pics but my archery success hasnt been too great the last couple years. Here is #2. Sorry for the truck pic. My son Max got his first bow kill yesterday afternoon. 18 yard shot, double lunged, ran 80 yards and fell in sight! Bear Apprentice bow and a Vortex boadhead. Tell Max congrats. Great trophy! Congrats to everyone! Way to go Max, that's a beauty! November 8, Nebraska Buck was missing his left hind foot, thus his right antler was messed up. Arrowed this 8 point in September and the doe in October. Kansas, November 9th. Came into a couple grunts and the 125 gr Magnus stinger did the trick, he died within sight. Opener for rifle today in MO. Mature doe followed by huge buck which never gave a shot opportunity with my bow. Some real dandies, congratulations to all! Kylet, WOW. Spot and stalk??? Had a hot doe come through with four bucks on her. Tried to stop a nice 4x4 twice without success. Next time she came by this buck was chasing her. Bleated as loud as I could and he put on the brakes at 15 yards. Great hunt! My PA buck tag is now filled. Was a fun hunt by using a buck decoy to draw him in for a shot. I passed on a smaller 8pt before getting a shot at this guy. 30yds using a QAD Exodus 125 through the heart. Shot this guy this morning in Kansas. Iowa 11/11. Public land. 13th day of a 13 day hunt. 30 yard shot, 80 yard recovery. A close up picture of the character on his fronts/bases. 11-10 -18 evening MI 6 point. Manitoba 11/11/18, it's been a couple years and this guy gave me a great 1/4 to shot. He went down in seconds. My wife's first whitetail....Kansas 4x6.......then my last day spot and stalk whitey. That’s awesome, huge congrats to her! And also to everyone else who has scored! My son in law arrowed this nice buck in Southern Kansas this am. Shot this Indiana buck yesterday. Got lucky when he decided to go cruising in the early afternoon. Heart shot with a VPA Terminator at 20 yards, and he traveled about 30 yards before tipping over. Those are probably his rubs you see in the background. I had a few trail cam pics of this buck, but this was my first live encounter with him. Shot this guy on the evening of November 5th in Nebraska. My dad rattled this guy and shot him this morning. Manitoba - Thanks again Adam and Matt! Got this buck Thursday before the Illinois gun season. Kansas 11/12 at 11:30am. 23 yards with my daughters pink camo Diamond Edge. Pass through heart shot. made a small circle and dropped within feet of the arrow. Nov, 5th. No pictures of him from this, or last year. Richland co wisconsin. Got this boy on 16 November, put a lot of time in this year with not much to show for it. Decided to try behind the house this night and had a bunch of does blowing at me down wind the first hour and I thought the gig was up. I stayed to last light and a single mature doe materialized. I figured a buck should be following but three more does followed, soon I was surrounded by does. Then this guy showed up staying in the thickets. For him, I had one shooting lane where they crossed the beaver bog and it was 45 yds but I had to pin point stop him to get at his vitals. With fading light and him silhouetted, I grunted, stopped him but struggled to find my red 40yd pin against his vitals. Finally made the pin out and released, everything in the fading light felt good. In a flash, I was able to make out the buck mule kick, reverse direction and he fell within 40 yds from the shot. He isn't a high scoring buck but he is the dominant buck around my property, at this point, I was glad to have harvested him. Good job all! Late rifle season in Colorado. Lots of nice deer this year. Congrats to all the lucky guys and girls and thanks for sharing the pictures. 11/10 Mississippi. My biggest whitetail. Congrats everyone. Some very large bucks! 4th doe of the season, KS, this morning a little after 7AM. No opportunity at a buck, yet. Very humbling season! Shot this buck on 11/6 in Muskingum Co, Ohio on the first hour on the first day . Some great deer. Congratulations everyone. There are some amazing deer on this thread. Congrats. Here's my Wyoming buck from yesterday. Great Bucks this year. Congrats! Great job all. Erin really nice to see successful huntress. Awesome mule deer in your gallery! Had a great hunt this morning.. 2nd largest bodied buck I've shot over the years. Watched him whoop a young 10pt about 30 seconds before I shot him...havent tagged in 4 years so I decided it was time to quit being so picky and have some fun..congrats to everyone above..
Congrats sir! I know how selfless you are when it comes to your sons, so I had to ask. Got a chance on a nice buck 11/20. I've watched this buck mature over the last few years and passed on him in 2016 as i felt he was a 4.5 year old with tremendous potential. I hunted him hard last year but had limited days with a SW or W wind and that kept me out of his core; i never saw him on the hoof in 2017 but i did have trailcam pictures confirming him on the farm and that his core was similar to 2016. I had high hopes he would make another big jump in antler development from 2017 (2016 he was 148", 2017 166"); while he did put on some mass and G4's, his right split G2 with kicker was smaller than last year. Regardless, this was my target deer. I have always hunted deer that i have had history of but i have never had the last two years of matching sheds. My "Rut-cation" started on 11/2 and at 2pm on 11/6, during a windy all day sit, he showed up on the east side of what i considered his core area. It was a new stand that i specifically hung to hunt him. He freshened a scrape and 3 rubs at 50-60 yards and i made a slightly forward, double lung shot at 42 yards (my longest archery shot/kill) with a Magnus tipped arrow and he went 30 yards. One of my most incredible histories with a specific deer; one that is almost bitter sweet as i will no longer be looking for his sheds in the spring and trying to encounter him. I believe he is 6.5 and he taped 177 5/8" (gross). Yikes Chris! That's awesome! Congrats! Sorry, didn't mean to hijack the thread! Very special deer to me for sure; bittersweet that it is over. great trophy. i think Winke once did a mount on a pole that had three shoulder mounts. The actual kill, and two others were the sheds, and of course different capes, of the same buck. It was really awesome. Just an idea. Great deer, Cris! Always an added sense of satisfaction when you target a specific deer and even more so when you have an extended history with him. Congrats. My first traditional buck... SE Oklahoma. Killed him on November 7th at 7:25 am. 8 yard shot and heard him expire at around 75 yards. Sometimes hard work and dedication is rewarded in spades. Grateful! Impressive! Good job, Troy! And on Thanksgiving day. Go Gophers! Oops. Still a dandy buck, t-roy. 11/11 IL. Lots of great deer this year, congrats to all! Got the one I was after. Lots of long drives and hours on stand. He won't score that great but he is a super cool deer and very memorable hunt. Persistence kills. This one is a special one for me. Congrats to everyone this year, lots of beautiful animals. Fun to see. Congrats to all some nice deer for sure. Nov 7 @ 2:30 Pa. cruising for does 21 inch spread. Sept 16th here in NJ. Nov. 8th- Iowa 214" Gross. You had a helluva' year Rob! Some great deer on this thread, congrats to everybody! I got this one on November 2nd in WI. I watched him breed a doe 4 times before she led him past me. Myself and the neighbors have several years of trail cam photos of him and I estimate him at 7 years old. I plan to send a tooth in to verify. He field dressed 215 pounds. Cool buck Roughcountry. Got any other angle pictures of him? Shot this buck first hour on the morning in Ohio on 11/6 . Took some doing, but here's mine. Did a semi-live over in the Colorado forum for those interested. Congratulations to all those above. Mike, we will need some more pics of that deer. We don't make many like that in MT! Very impressive animal, well done. Madam Beartrack got it done. I'll throw mine in the mix. 12 Nov. He was cruising solo. 18 yard shot, 30 yard recovery. 3.5 years old, dressed at 160lbs. Tn public land. I still have a tag so we will see what the late season brings. Awesome bucks ladies and gentlemen, Congratulations!!!!! My son Zach with his 3rd Nebraska buck of the year. He drew the Super Tag so that deer tag didn’t count towards his two buck tags. What a season! Way to go Zach! What a year you have had. I love all the snow in the background. Late season hunts are so fun! Already posted one of these but I will probably never have a better whitetail season. Some great animals here this year. Congrats to all! A little late season success. Was chasing a doe...Latest I have seen that. Shot this one November 11. Fifth anterless, MO. This evening. Awesome deer Zbone! With a stick and string too!! Nice work. My first deer. Straight through the heart and out through the right lung from 67 yards. To bad it was small. Gunmaster be proud it's your first deer harvest and you have the rest of your long life to hunt. gunmaster: Good shot, doesn't matter how big it is, congrats.